TITAN’S SPRAWLING CAMPUS in Bengaluru boasts an asymmetric, fluid design, epitomising the company’s design sensibilities. It is all about open spaces, light and free air movement. For Titan’s managing director Bhaskar Bhat, it is the perfect place to speak about creating masterpieces, and also about newer businesses. Tatas have a significant presence in the defence sector, an association that dates back to the World War I era. Titan was formally launched in 1985, during the days of the licence raj, when watch smuggling was rampant in India. Bhat said the company wanted to create a differentiated offering. “The combination of branding, design and manufacturing technology was modern at that time,” he said. “Conceiving a manufacturing model, where you hired people from the local area and developed them, not just what consumers saw—a great watch, great advertising, quartz technology—but the whole thing, was unique,” he said. Titan continues to make watches and jewellery, and has diversified into other products such as perfumes, eyewear and saris. Bhat said Titan’s uniqueness was its “ability to smell an opportunity”. He gave the example of its joint venture with Timex. “We made that brand number two, putting all the power of Titan behind it,” he said. Tatas have a significant presence in the defence sector, an association that dates back to the World War I era. Its presence is felt in land, air and naval systems. 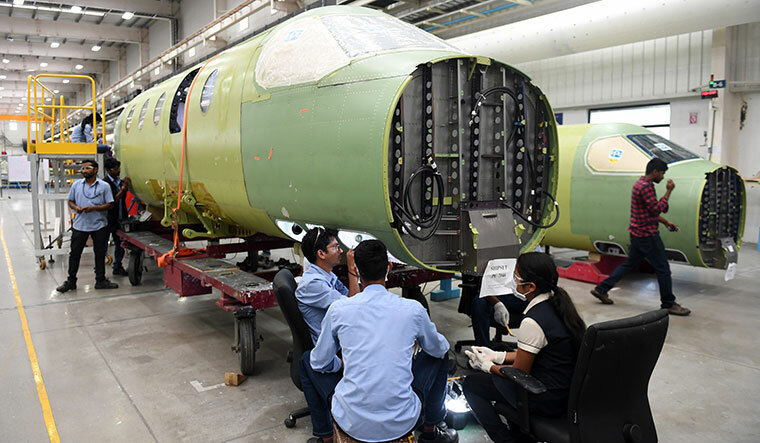 With India’s large and growing domestic aerospace market, the group has set up an advanced capital-intensive aerospace infrastructure. “We should look upon defence in the context of the country as an opportunity, to up our game on technology, innovation, design and manufacturing capabilities,” said Banmali Agrawala, president, infrastructure, defence & aerospace, Tata Sons Limited. “India is one of the highest traffic growth markets in commercial aviation globally. So it is just a question of time that you would need not just components, but complete aircraft to be made over here,” he said. Agrawala is positive about unmanned aerial vehicles and drones as they straddle civilian, commercial and defence applications. “The whole thing about defence industry is that you have essentially one customer, the ministry of defence. If it decides to go at things on scale, you will then find the industry respond by innovating, by investing money. We have invested in this, we have got the experience, the temperament, the relationships and global partnerships. We just feel we are pretty well-positioned to cater to this opportunity,” he said. Meanwhile, at Pune’s beautifully designed innovation centre of Tata Chemicals, the focus is on two areas: material sciences and inorganic chemicals, and food science and nutrition. Physicists, chemists, biologists, chemical engineers, nutrition scientists and food science experts work together with state-of-the-art infrastructure. “I think the interdisciplinary science environment and the way we translate that into products speak volumes,” said Dr Ashim Mullick, who heads the centre. Besides their traditional chemical businesses, Tatas now focus on nutraceuticals and speciality chemicals. “We have fructooligosachride, which is already commercialised. That is a prebiotic. It helps your gut health, which is a very big problem in a developing country like India, and also in developed countries because of their diet patterns,” said Mullick. The centre is also working on a project to use silica in car tyres as an alternative to carbon black, which is neither environment-friendly nor sustainable. “We are probably one of the first manufacturers of silica for tyre applications and have worked with almost all major tyre companies in India,” said Mullick. For Tata Motors, key future features include different alternative fuels and powertrain solutions. Guenter Butschek, chief executive officer and managing director, said customer behaviour was likely to change in a country with 60 per cent of its population under 35 years, and 50 per cent under 50. “We need to make sure that as we get the present right, we do not miss the future,” he said. At Tata Consultancy Services, automation is big. Rajesh Gopinathan, chief executive officer and managing director, spoke about ‘Machine First Delivery Model’, a concept being pioneered by TCS. “The idea is how do you make technology or automation so deeply integrated that it is not about can this be automated [or] can that be automated, it is how humans and machines work together effectively,” he said. Gopinathan spoke about a case that was being piloted overseas. “You are in a car, you have the airline app on your phone, you have shared data with them, they know that you are unlikely to make the flight. Instead of you calling the airline, if the airline could initiate the call or send you a message that we know that you won’t be able to make the flight or if the flight is delayed they can tell [you not to be stressed and] there is another flight in an hour’s time, there are seats available,... [and] this is what it is likely to cost you.... How do we integrate it and automate the whole process so that a solution is being presented to the customer and they are being asked to choose, whether to hold it…[or] make a reservation. It will change our whole approach,” said Gopinathan. He also spoke about the pharmaceutical sector where the need was for more targeted drugs. “As the big-ticket medicines or diseases have all been explored, the need is for more and more targeted drugs which means that you are not going to have huge, mega blockbuster kind of drugs, you are going to be targeting it for much more niche areas,” he said.